During the hearing, the court was told how Katrina was let down by a catalogue of errors by medical staff. It was revealed Katrina had raised the alarm with medics about her mental health but while her doctor urgently referred her for treatment – a youth service’s team disagreed with his prognosis. Deeply-troubled Katrina spoke of demons and warped reflections in the mirror surrounded by ‘horrible things’, Norfolk Coroner’s Court heard. Her GP, Dr Peter Lawson, of Market Surgery in Aylsham, Norfolk, made an urgent 72-hour referral to Norfolk and Suffolk NHS Foundation Trust on March 16. But the youth services unit disagreed with Katrina’s worried doctor. They made a routine appointment for her two months later in May after carrying out a triage assessment. The following week, Katrina was visited at home by a private consultant psychiatrist. The specialist made another 72-hour urgent referral to the trust, through Dr Lawson, on March 30. Tragically that referral was never acted upon. The inquest heard that due to ‘human error’ in the admin team it was never seen by the clinical triage unit. The appointment for May 27 was then cancelled with three days’ notice as the youth services set-up was restructuring and had an ‘unusually high level of referrals’. 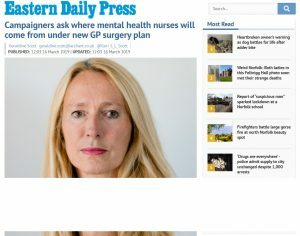 Meanwhile, some consultants in the Child Family and Young Person (CFYP) service can find the time for private work, to be clinical directors of private hospitals or to go swimming at UEA and enjoy long lunches whilst paid handsome salaries by the NHS as NSFT loses teaching income for poor performance. An NSFT consultant psychiatrist was paid for two days per week to undertake an NHS postgraduate degree in health management and leadership. The NHS paid for the course. When clinical leadership was required in their service, the doctor claimed not to have time but still had time for private work. 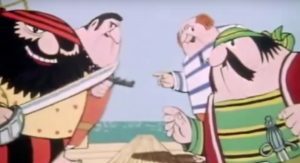 Shortly afterwards, they took up a position at a private hospital ‘on the side’ of their NHS job. Meanwhile, patients wait for appointments: some are never seen. 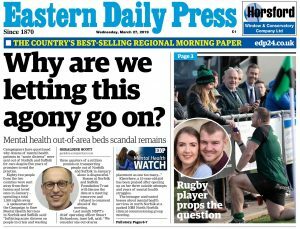 Nearly half of the NHS beds for young people in Norfolk and Suffolk, built at a cost of nearly one million pounds, have never been slept in because NHS England refuses to fund them. Katrina Rolph’s parents were so desperate they felt compelled to go private. NHS waiting lists create private work from those that can afford it, as well as misery for people who can’t. We’ve repeatedly raised the issue of what is euphemistically called ‘medical productivity’ with the Chair of NSFT, Gary Page, the Medical Director, Bohdan Solomka, the Operations Director, Debbie White and the Finance Director, Julie Cave. Some consultants are seeing only half a dozen patients per week in clinic. We’ve worked with NHS Improvement to try to stop ‘New Ways of Shirking’, we’ve raised the disgrace of the minority of lazy doctors at NSFT Board meetings and in private. 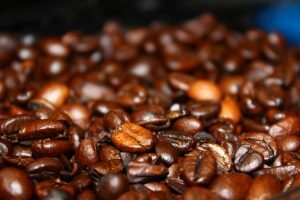 We’ve even spoken to the Care Quality Commission (CQC). The bottom line is that patients and carers care deeply about prompt access to doctors but the Board of NSFT doesn’t. Nothing shows this better than NSFT’s decision to move many clinical staff to a business park on the outskirts of Wymondham, Gateway House, which lacked any facilities to see patients and to close the city base of adult community mental health services in Norwich. 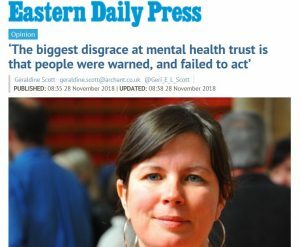 There still isn’t a base for adult community mental health workers in Norwich. Sadly Katrina missed her next appointment on July 24. So the team discharged her on August 12 after never actually assessing her face to face. Katrina vanished on a family holiday to Hempstead, near Holt, Norfolk, last September. A pilot scheme is also going ahead in Great Yarmouth, Norfolk, in a bid to ensure that more detail is passed on from GPs in referrals. Rather late, given that suicides in Great Yarmouth have risen at a rate thirteen times higher than the national average. Great Yarmouth is one of only nine CCGs in England that is failing to meet the national minimum funding standard for mental health. Unexpected deaths have more than doubled at NSFT since 2012-13. In May 2017, there were 19 unexpected deaths. In the whole of 2012-13, there were 88, an average of seven per month.